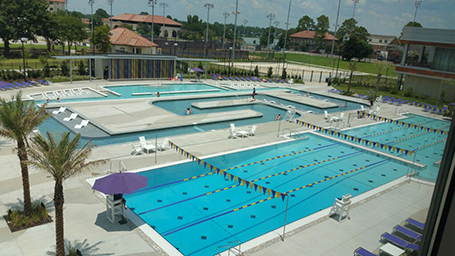 Designed to promote “healthy buildings for healthy bodies,” the renovation and expansion of the LSU Recreation Center increases student program offerings for fitness, leisure, wellness, aquatic and outdoor adventure in a sustainable, flexible environment. Completed in 2017, the new Student Recreation Center includes a lap pool, a one-of-a-kind lazy river, tennis courts, sand volleyball courts and a high-low ropes challenge course. In addition to the 34,000 sq. ft. outdoor recreation area, the new-expanded 231,355 sq. ft. recreation center includes cardio and weight room space, six group fitness studios, a 38-foot-high climbing wall and bouldering area, five multipurpose courts, three MAC gyms and a functional training area. A 1/4-mile indoor elevated track winds through the space like an LSU Tiger tail and incorporates an inclined sprint track. The desire for this pool was born from focus group efforts made during the programming phase of the project. Students ultimately voted and decided they wanted a leisure pool and lazy river in addition to fitness lap swimming as a part of the aquatic programming at the new recreation center. The idea for the ’LSU’ lazy river was created on a napkin sketch by Laurie Braden, UREC Director, and translated into a hydraulically functional possibility by Counsilman-Hunsaker. This signature design compliments the overall branding of the newly expanded UREC facilities and is sure to be an attraction on campus for students and faculty alike.